Mad River Outfitters works hard to serve as "the source" for everything needed for your fly fishing experience. Professional guide service to destination trips. We take great pride in offering knowledgeable and honest advice when it comes to your pursuit of the sport of fly fishing. Along with companies like Orvis, Patagonia, Filson, Barbour, Simms and other fine vendors, we are proud to provide the best products, outstanding service, and knowledgeable instruction and advice. Customer Service has always been a benchmark of Mad River Outfitters and we pledge to do our very best to make your experience with us as pleasant as possible. You simply won't find a more extensive selection of flies, fly fishing tackle or fly tying materials in the entire Midwest! Our staff looks forward to sharing our expertise and enthusiasm for the sport of fly fishing with you in the near future. 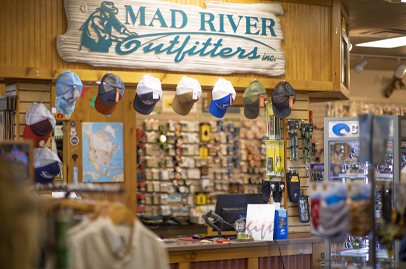 Mad River Outfitters was founded in 1994 by current president/operator, Brian Flechsig. Brian has been a fly fishing guide and in the fly fishing business for most of his adult life. After managing other fly shops, he realized the Midwestern region needed a better shop with better service. At that point, Brian moved to Columbus and opened Mad River Outfitters. With the help of great employees and friends, Mad River Outfitters has become one of the largest and most recognized names in the fly fishing business. In 2002, Mad River Outfitters was nominated as "Fly Shop of the Year" out of over 400 dealers in the U.S.
We sell the finest in quality fly fishing and outdoor products from vendors such as Orvis, Simms, Sage, Winston, Scott, TFO Patagonia, Filson, Barbour, Howler Brothers, Kuhl and more. Professional Fly Fishing Guide Service for Ohio, the Great Lakes Region and Beyond! Call us at 888-451-0363 or contact us here!